Posted by Jeff Kauppila on Tuesday, March 27, 2012 in Related News. Beginning in 1995 TRIUMF has built up several beam lines that provide low-intensity, energetic proton and neutron beams to simulate natural-radiation exposures either in space or terrestrial environments. Even at low intensity, a few minutes of exposure in these beams can correspond to years of operation in space, air, or ground so that accelerated testing for errors in electronics can be carried out. Since then, TRIUMF has become recognized as a premier test site for space-radiation effects using protons and by converting these protons into neutrons, testing with neutrons is also performed. In a typical year about 90 users from 25 to 30 companies in Canada, the United States and Europe make use of TRIUMF’s Proton Irradiation Facility (PIF) and Neutron Irradiation Facility (NIF), along with leading radiation-effects researchers. 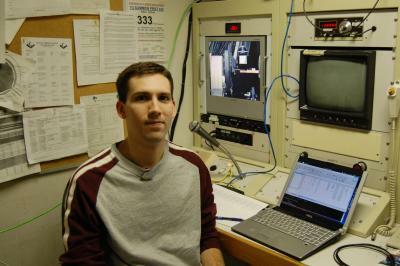 Dr. Brian Sierawski, an engineer at the Institute for Space and Defense Electronics at Vanderbilt University, regularly comes up to TRIUMF to conduct his experiments on soft errors in electronic devices using PIF & NIF. 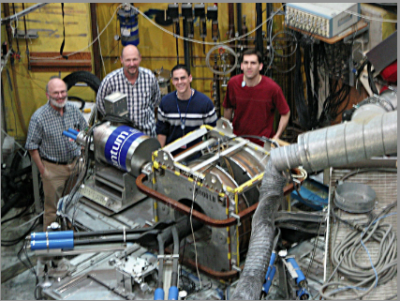 In 2010, Brian and other researchers from Vanderbilt University came to TRIUMF to test for errors not with protons or neutrons, but with muons from the M20 surface-muon channel. With the support of industrial partners from Texas Instruments, Cisco Systems, and Marvell Semiconductor and funding from the US DTRA and NASA, data were collected to demonstrate the existence of muon-induced soft errors. This work has earned Brian the Top Student Paper award at the 2011 IEEE International Reliability Physics Symposium (IRPS). IRPS takes place each April to share new discoveries in microelectronics reliability. Brian’s work focuses on understanding the effect of lightly ionizing radiation events on the operation of microelectronic devices. It has been recognized for over 30 years that natural sources of radiation such as protons and neutrons can cause “soft errors” which is the spontaneous switch in a memory bit from a 0 to a 1, or vice versa. Although these errors occurred in older technologies, as new electronics are being built smaller, they are becoming more sensitive to lower levels of ionizing radiation. Brian’s work demonstrates that low-energy muons can affect the newest microelectronic devices. With the high reliability of equipment becoming ever more important, this work could have relevance to the design of data servers, medical equipment, and aerospace technology. Muons occur in the natural world as a by-product of cosmic radiation striking the earth’s atmosphere and TRIUMF offers the only muon beams in North America for these types of tests. The experimenters directed a beam of muons at SRAM memory modules and demonstrated that the resulting ionization did indeed cause soft errors. As has been demonstrated for low-energy protons, muons have been suspected of also being able to cause soft errors but this is the first time this effect has been demonstrated and could position TRIUMF as a key research centre for such research. This important research continues at TRIUMF with an EEC-approved experiment led by Sandia National Laboratory and Vanderbilt University. With PIF & NIF and insights from experiments like these, we discover more about the nature of radiation-induced errors and continue to ensure the reliability of future electronic devices. Congratulations, Brian! B. D. Sierawski, R. A. Reed, M. H. Mendenhall, R. A. Weller, R. D. Schrimpf, S.-J. Wen, R. Wong, N. Tam, and R. C. Baumann, “Effects of scaling on muon-induced soft errors,” in Proc. of the Int. Rel. Physics Symp., Apr. 2011. B. D. Sierawski, M. H. Mendenhall, R. A. Reed, M. A. Clemens, R. A. Weller, R. D. Schrimpf, E. W. Blackmore, M. Trinczek, B. Hitti, J. A. Pellish, R. C. Baumann, S.-J. Wen, R. Wong, N. Tam, “Muon-Induced Single Event Upsets in Deep-Submicron Technology,” IEEE Trans. Nucl. Sci. 57, 3237 (2010). — by Aaron Lao, Communications Assistant with files from Mike Trinczek.